The kids and I spent four and a half hours at the auto repair shop getting our AC fixed. I know, sounds like pure torture doesn't it? Actually, other than wasting the time there instead of quilting or some other needful activity, it wasn't bad. First of all, my kids are awesome!!!!!!! So stinking proud of them! The shop is owned by a family of Mennonites, and there was a big box of toys and shelves and shelves of good books for adults and kids. My kiddos kept themselves occupied (Leah also had her crochet) for the first three plus hours. Then they started begging for use of my tablet. Then I laid down the rules: each got 5 minutes and then someone else had a turn. They were so good! The matriarch of the family is an avid quilter and long armer. We talk quilting when she has a few free minutes. 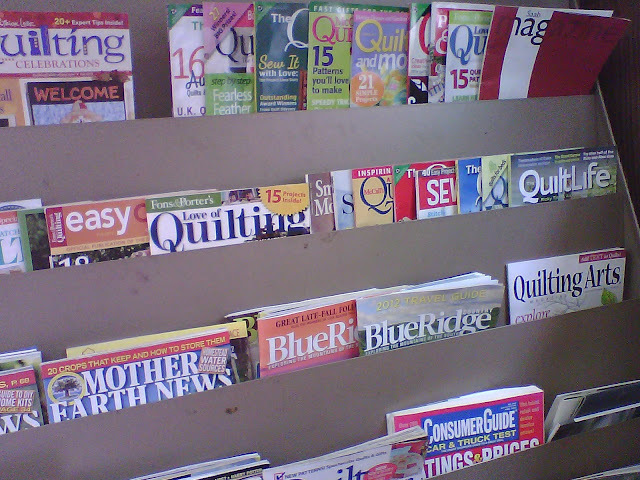 She told me that they were cleaning out the magazine rack recently and she made sure they didn't toss the quilting magazines. And lastly, the repair didn't cost an arm and leg. Nice cold AC again, just in time for a trip to Missouri. My step-daughter will be making me a grandma pretty soon. I'm happy for her, but couldn't I be done with potty training my little guy first?! Now, I'm off to quilt my heart out. I hope you get to do the same soon. What a delight! Dentists and doctors could surely use a magazine rack like that.